The EPIC process begins with an opportunity to get to know each other, what we call community engagement. Trailblazers organise to visit a village and gather basic data. 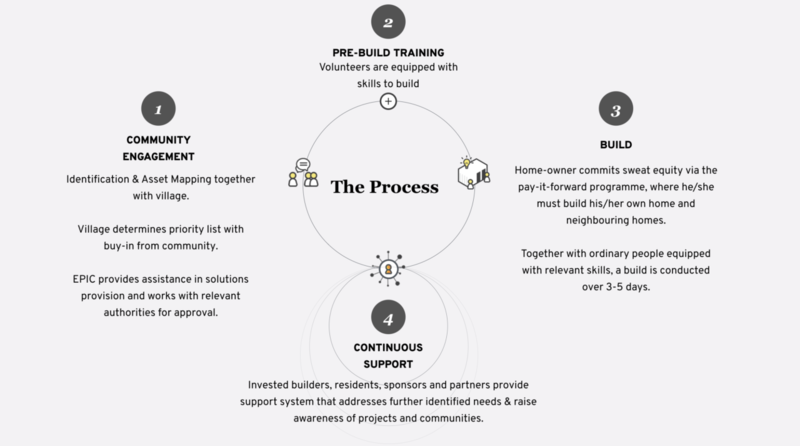 The community is then facilitated to coordinate and determine their own criteria for housing assessment and working methods, and in turn establish a priority list. Home-owners are partially engaged in the design process, determining select components based on family needs and preferences. They are also involved in preparing the build site and prior build coordination and communication. Home-owners commit to the “Pay It Forward” programme, where they build their own home together with the participants, and build for their neighbours. Residents have been hired contractually for builds, from concrete casting to leading other home-owners and teams in different villages and other build opportunities, including their own economic initiatives such as traditional craft workshops by incorporating them into projects when available. To empower people to provide these homes, we have designed a unique experience that equips ordinary people with the skills and technology needed to build a home in as little as three days. This system is modular, which allows for flexibility in terms of size and environment. Throughout the 3 days, the builders go through a meaningful experience in discovering themselves, the power of a team and build a home with a family. However, it doesn’t stop there! Builders are encouraged to continue to get to know the family and uncover other strengths they may have, the dreams they may have and the aspirations of the community. By working together, they can begin to explore these other facets of development and create new solutions to further address the poverty cycle. © 2018 Copyright EPIC Collective Sdn Bhd. All rights reserved.